The feast of the Epiphany, also known at the feast of the Three Kings and Twelfth Night, officially brings the Christmas season to a close this weekend — but in many of the places CNEWA serves, particularly those with deep Orthodox and Byzantine roots, it is just as grand a feast as Christmas, with distinct traditions and celebrations. The word “epiphany” comes from the Greek ἐπιφαίνω (epi-phaino), which means “to shine forth, manifest, reveal.” The feast celebrates the visit of the Magi to Bethlehem, which is recounted only in the Gospel of Matthew — and even there, with very little detail. Despite the traditions that have grown up around the feast, Matthew does not tell us who these visitors are, where they came from other than “from the East,” or even how many there were. Christian tradition has “filled in the blanks” for 2,000 years and has had as many as 14 visitors, coming from all over Asia and Africa (which is not “from the East”) and even given them different names. Ultimately in the West, Christians settled on the number three because of the number of gifts. San Apolinare Nuovo, a sixth-century church in Ravenna, Italy, has a magnificent mosaic of three Magi, named Balthasar, Melchior and Caspar, indicating that the tradition was beginning to solidify at least in the West just a few hundred years after the time of Christ. For Matthew, who is writing primarily for Jewish converts to Christianity, it is important to stress the universal mission of the Messiah born in Bethlehem. Regardless of how many there were or where they came from, it is absolutely clear that the Magi are Gentiles. In Matthew’s Gospel the Gentiles are among the first to recognize Jesus. For Matthew the visit of the exotic strangers is truly an epiphany in that the true person and mission of Jesus “shines forth” and reveals itself. Jesus is not merely the hoped for Messiah who has come to save the Jews, but he is also the “shining forth,” the revelation of God’s Son to the entire world, Jew and Gentile alike. Liturgically since very ancient times, the Epiphany and the end of the Advent-Christmas season was seen as part of a series of epiphanies. The Gospel readings at the eucharistic celebration immediately following the feast of the Epiphany have traditionally dealt with the Baptism of Jesus in the Jordan and the Marriage Feast at Cana. The Gospel accounts of the Baptism of Jesus in the Jordan are found in the Synoptic Gospels of Matthew, Mark and Luke and each recounts a voice from heaven declaring Jesus to be the “Beloved Son.” In all the Gospel accounts, including John, a voice from heaven and the descent of the Spirit in the form of a dove form an epiphany, a revelation of who Jesus is and what his mission is. In sum, this period after Christmas is a time of light and revelation — and, really, three epiphanies. The first epiphany is what we traditionally refer to as “the Epiphany” and is the shining forth of Jesus as a “light of revelation to the Gentiles” (Luke 2:32). The second epiphany at the Jordan reveals Jesus as the Beloved Son of the Father and the third and last epiphany of the season is the revelation of Jesus as the worker of might deeds and miracles at Cana. Thus by the end of the Christmas season the Church through the liturgy not only proclaims that Christ was born in Bethlehem, but also teaches who he is and what his mission is. The Rev. Petro Chudyk celebrates the Divine Liturgy in his church in Tarashcha, Ukraine. 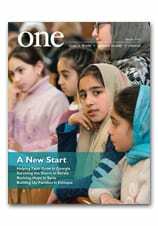 Journalist Mark Raczkiewycz offers a revealing glimpse at the struggling but growing church in Ukraine in the December 2017 edition of ONE. Here, he explains some of the burdens placed on the local priests. The only way to describe what I saw on three reporting trips within the central Ukrainian Kiev Eparchy is selfless commitment. Priests at these nascent, under-served parishes live under the same conditions as the parishioners. The parishes often have to go without a proper prayer space, such as a chapel; also usually lacking is recreational space for activities such as catechism classes or tea and coffee after the liturgies. Priests usually are based in impoverished communities that often cannot afford to donate enough money to cover basic needs for the liturgies: candles, charcoal, bread, and wine. As a result, clergymen often draw on their own resourcefulness and creativity to service these communities. It is often trial and error. They must exercise wisdom and patience to explain the church, it customs, holidays and prayers. Again, it is often done on a rudimentary level; 70 years of oppressive Communist rule drained much of the spirituality and religious knowledge from the people. To a certain extent these communities resemble those of the early Christians in the first few centuries of the Church. They pray wherever they can find space and draw on their own strength to build communities. Parish priests get some administrative support from the curia. They attend networking events where experience and ideas are exchanged among priests to see what works in different communities. Charity groups such as Caritas and CNEWA help out as well. For example, CNEWA donated a $15,000 portable wooden chapel to a parish community in Tarashcha, a district town 80 miles south of the nation’s capital of Kiev. In December, the Catholic charity Caritas provides gifts to needy children on St. Nicholas Day. Priests look for benevolent sponsors to send parishioners to retreats in the Carpathian Mountains in the western part of the country. And the curia tries to buy at least four properties a year for its clergyman so that they don’t have to rent living or prayer space. Still, despite a seminary school having opened in 2010, the Kiev Eparchy can’t keep up with demand. As I write this, 10 communities were awaiting a parish priest. The Eparchy witnessed a surge of parishioner interest in the Ukrainian Greek Catholic Church during the so-called Revolution of Dignity in 2014 that ousted a corrupt, Moscow-friendly president. The church was one of the first institutions to provide shelter, food and pastoral care to the freezing protesters that winter. These tumultuous events spurred people to find answers to deep questions about their faith, their future and the country’s survival. They often turn to the church for guidance and solace. The result is truly an inspiration. I saw parish priests meet these challenges with an amazing sense of dignity — albeit under adverse conditions. And the people are eager to be a part of it all. For an intimates look at the church in Ukraine, watch the short video below. And read more about Planting Seeds, Nurturing Faith in the current edition of our magazine. CNEWA’s president Msgr. John E. Kozar just returned from spending Christmas in Bethlehem — and shared the above photograph, from a vespers service on Christmas Eve at the Church of the Nativity. Archbishop Pierbattista Pizzaballa, the Apostolic Administrator for the Latin Patriarchate, presided. Msgr. Kozar is shown standing, third from the right. What a blessing, to be in this particular part of the world — where Jesus was born, grew up, proclaimed the Good News, was crucified and rose from the dead. The Lord entrusted me with the flock of his homeland and to follow in the footsteps of the apostles. When I was taught how to meditate on a Gospel passage, I was asked sometimes to imagine the places where Jesus lived: Capernaum, Tiberias Lake, Nazareth, Jerusalem. Now I know all these places, and they remind me of the historical facts. But Jesus is not only part of the history, he is still alive and in the midst of his church. When you enter Peter’s house in Capernaum, where Jesus healed the paralytic; when you see the place where he fed five thousand people; when you are in a boat in the middle of the lake where he walked on the water; and many other holy sites, I assure you that you feel you are sharing the experience of the apostles and the crowds. You feel privileged being Christian. Visiting these sites — let alone living there — is a spiritual retreat. Many of my predecessors used to say, “I am the archbishop of Jesus.” I don’t dare say that, but it’s true in a way that the bishop in Galilee is responsible for Jesus’ hometown. What a blessing! But in the same time, it’s a huge responsibility and difficult mission for many reasons. Read more in this Letter from Galilee to discover why. Worshipers pray during Mass on New Year’s Eve at St. Joseph’s Catholic Church in Cairo. At least ten were killed in two attacks on the Coptic community Friday.